Okay, Folks, I may have listings up on eBay, I list dolls, doll clothes and doll furniture, and some other stuff. Vintage Kestner Dolls...Fine Composition and Bisque! A desirable vintage Kestner Doll mold number made by Kestner is the #143. A pensive face that is now often referred to as a character, she sometimes appears ready to cry. My apologies for the quality of the black and white photos. 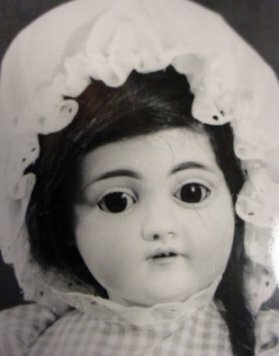 They are snapshots of dolls that have long ago been adopted by other collectors. All that remains are these shadowy images taken long before the advent of digital cameras. Another common "dolly face" mold is number 147. 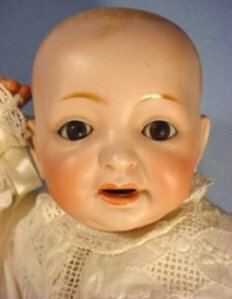 This vintage Kestner doll has a composition ball jointed body..
A Kestner baby vigorously sought by doll collectors is marked only J.D.K., Made in Germany 11. The solid bisque, painted hair baby, is a darling. Yes, his ears are big enough to hold his hand in position. 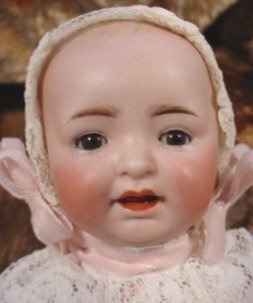 eBay has a rather large set of listings of vintage Composition and Bisque dolls for sale, if you are interested in a purchase, or to find values, (if looking for costs, it is necessary to register with eBay). 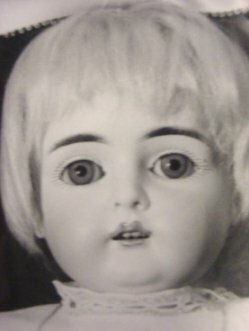 The last photo is of the very first vintage Kestner bisque doll I ever purchased. Many French baby dolls came and went through the years, but this precious baby has a permanent residence. A small solid dome with painted hair, he is marked J.D.K, Made in Germany 8 1/2. His two tiny teeth are not that visible in a photo.